Safe weedkiller gel. 240g/L Glyphosate Gel. No spray. 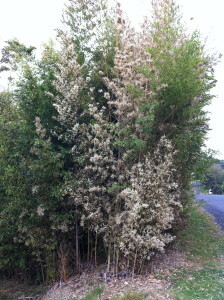 Designed for bamboo but also great for privets and other coppicing shrubs and trees e.g. Rhamnus and Gorse. Cut’n’Paste only affects treated plants and is safe to use next to desirable ones. Bamboo: Cut about 2cm above a node near ground level (The idea is to get that cup shaped profile so the gel does fall down inside the cut stem). IMMEDIATELY Paste cut surface and into middle of stem. A delay of a few seconds dramatically reduces success. Work in teams of two or three. One cutting, one pasting and one clearing away. Being thorough and systematic makes all the difference. It takes more time but it makes the difference. Privets and other hardwoods: Cut very close to the soil, scrape bark off below the cuts, cut off both ends of any exposed roots and any leafy shoots. Liberally paste all exposed wood. You can download the hazard notes and safety sheets in the links above. As a precaution wear impermeable gloves. Do not use if rain is expected within four hours as gel could wash on to desirable plants and effectiveness could be reduced. Re-treat any new shoots that arise. Rinse the brush top after use removing dirt and excess gel. Refill from bulk supply or recycle the container after triple rinsing. Our new gelling agent is much easier to apply but stays better on the stumps and wont run. Do not apply on or around food crops or areas to be grazed by animals. In tightly closed original container in a cool dark place, away from children, pets, foodstuffs, seeds, fertilisers and pesticides. Kept as recommended the gel will show no sign of appreciable deterioration for at least two years from the Date of Manufacture (DOM). Glyphosate IPA CAS 38641-94-0 EPA approval HSR100736 Hazard rating 9.1D (Not dangerous goods). Skin and clothes contact: Wash thoroughly with running water. Remove the soiled clothing. Ingestion: Dilute with several glasses of water. DO NOT induce vomiting. For advice ring 0800 764 766 National Poisons Centre. Eye Contact: Hold eyelids apart and flush with running water for at least 15 minutes. Seek medical advice if irritation occurs. There are some plants such as bamboo, Chinese privet, tree privet, cotoneaster and rhamnus (Italina or evergreen buckthorn) to name some of the worst offenders that are hard to eradicate from your gardens and bush blocks. Bamboo Buster is your Boy at 240g/L of glyphosate. Take bamboo for instance. You may have seen a cute bamboo plant in a container at a garden centre and thought that it would be nice to have your own little stand of this cane plant. It would be great to be able to pick your own bamboo stakes for free. So with no more thought you purchase the cute plant. A few years later you find you have released a monster into your garden. Sometimes one inherits a stand of bamboo when buying a new home and you wonder later on if the previous owners only sold the house to be rid of the bamboo. 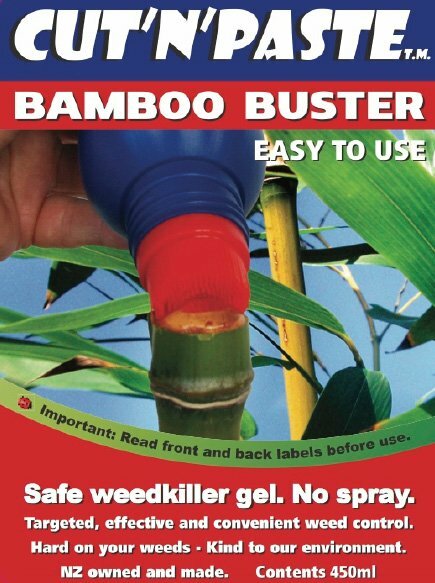 Bamboo Buster is designed to tackle those toughest of all weeds, Bamboo. There are over 1000 species of Bamboo in existence. Some spread like wildfire and are much more of a problem weed than others and whilst many are not in New Zealand there are a great number of different types that cause problems for landowners. Some are easier to kill than others. Generally if the stems are really small it’s going to be harder to get enough herbicide into the plant so re-treatment is more likely. For Bamboo species – Cut near to the ground, just above a node (see the photo on the front label above). The near to the node the better so that you have this cup shaped profile to hold the gel in place so it doesn’t drop down inside the stem. IMMEDIATELY paste the entire cut surface of the stump and some into any hollow in the middle of the stem. A delay of only a few seconds is too much. It’s essential to get enough of the herbicide into the underground root system. Don’t skimp on the use of the gel on each stem. Apply a generous layer of paste to the whole area of the cut stem. If a part of the surface is missed that section of the stem may survice. Apply IMMEDIATELY with care and it will pay dividends. Make sure you apply the paste as quickly as possible after cutting. That means immediately. When stems are cut the plant quickly withdraws its sap and seals the cut. When the paste is applied immediately it enters the plant most effectively. If you are adding blue dye, do be aware that this encourages whoever is doing the work to cut far too far ahead before applying the paste. This will decrease effectiveness. Simply add 100ml of blue dye per 20L and roll the container until the dye is mixed in. The ideal methodology is one person cutting, one clearing away cut stems and one pasting. By using a third person whose job is simply to apply the paste in the way recommended you will get the best results. If you want blue dye in the gel you can order this on 5L or more by calling us when you order, but we recommend you don’t as it’s messy and you really don’t need it if you use this methodology. Using blue dye can make you think you can just go ahead and do ten plants and come back and paste, not a good idea. Clumping varieties in general cause less problems than those with long underground rhizomes that can spread rapidly damaging decks, water tanks, concrete paths etc. They are often very hard to get rid of. Bamboo Buster has been trialled on a number of different species with very satisfactory results. Some species may require several follow up treatments until all vigour has gone from the root systems and no more shoots reappear. Where the clumps are very large the underground rhizome masses will also be very large and you can expect some significant regrowth though this will be much less vigorous. Where deformed new growth appears from old stumps cut and paste again. Where there is regrowth of many little stems wiping the leaves with paste may be effective. There are other more toxic methods of killing bamboo, some of which are more immediately effective but they have long term residual effects on the soil and other plants nearby. Some species will show no regrowth, others will require repeated but exponentially reducing retreatments. Bamboo Buster gives you the possibility to tackle your bamboo without spoiling your soil. Bamboo Buster is also great on all those very tough woody weeds like Chinese privet, tree privet, Rhamnus alternus (evergreen buckthorn), willow, gorse, barberry, hawthorn and other vigorous coppicing shrub weeds and trees. For instructions on killing these scroll to the bottom. When outlying bamboo shoots are treated the die back can reach some distance into a neighbouring clump of bamboo as the effect travels along underground root systems (rhizomes). Like all Cut’n’Paste products, Bamboo Buster is the lowest possible toxicity to animals whilst being very effective on your weeds. Bamboo Buster has lowest herbicide hazard classification of 9.1D. It is not dangerous goods and can be posted. Bamboo Buster is available in 450ml bottles as well as the usual 5 and 20L bulk containers. If you would like blue dye added just ask for it to be added when you order 5 or 20L containers. All first orders of 5 and 20L must buy a pump to refill bottles.